John Cohen at Merle Wood & Associates tells me he's joined Joe Marino at Atlantic Yacht & Ship to list the nearly-new 27m motor yacht Selene for sale. 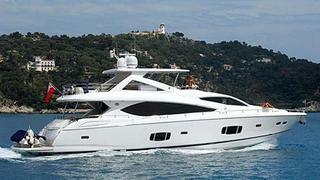 Delivered earlier in 2012, Selene is a Sunseeker 88 and has US specifications and is US duty paid. An interior in black American walnut accommodates eight guests in four staterooms while twin 1925hp Caterpillar engines deliver a cruising speed of 23 knots. On display at the Fort Lauderdale show, Selene is asking $5,495,000.